For much of its history, the city of Fort Wayne has been a town of function. The settlement that would one day become the city was founded and thrived due to its proximity to the St. Joseph, St. Marys, and Maumee Rivers. The outpost was used as a trading post for the military, settlers, and pioneers heading west. The developments of the Wabash and Erie canal, and later the railroad, furthered the town’s focus on commerce. The area’s abundant natural resources, and dedicated population, led to consistent industrial growth. Even during The Great Depression the town was able to grow economically. Throughout its relatively short life as a city, Fort Wayne has attracted many major businesses like Lincoln Insurance, General Electric, and BAE Systems. The town’s focus on business development, however, has had its repercussions. While the town's large industry focus undeniably yielded positive economic results, it also resulted in a lack of community appeal. The small number of local, citizen-centric services created an impersonal city atmosphere. According to Scott Bushnell, author of Historic Photos of Fort Wayne, “Downtown was commerce ...” There was no separation between the city and its industry. The city existed to serve big businesses, not the residents of the city who supported them. Additionally, there were few downtown housing options, and even fewer leisure establishments. 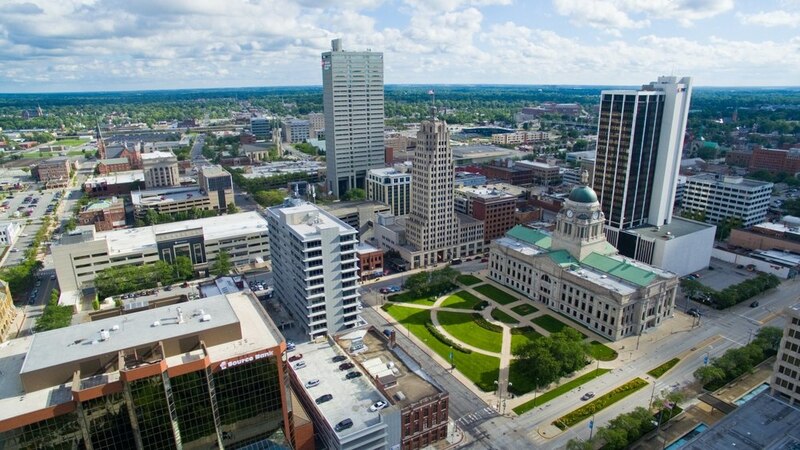 As a result, Fort Wayne has been ranked among the least interesting cities in Indiana multiple times, and was even ranked the 5th most boring city in America on one occasion. However, in recent years the city has been following a downtown development plan to eliminate this stigma. Among the planned developments were the construction of The Harrison and the Cityscape Flats apartment buildings, which together provide over 200 new downtown living spaces. Additionally, the Ash Skyline plaza building project that is expected to be completed later this year will feature 124 apartments, as well as several local business offices. Not only is the city committed to increasing the number of downtown community members, it is also improving its community building events and programs. In an effort to increase the livelihood of the area, the city recently partnered with Zagster to bring bike sharing to Fort Wayne. Residents can now sign up for the program at Zagster/FortWayne, and use their smartphone to rent a bicycle from any one of the 5 stations located throughout downtown. And of course, the ongoing effort of those working in the 99 blocks of the Downtown Improvement District (DID) is serving to grow and diversify the city's offerings. The district serves to connect the local government with businesses and organizations whose missions concern strengthening the Fort Wayne community. Up next for the DID is its sponsored series of free Lunch on the Plaza concerts. The events are returning this year by popular demand, and will be held every Thursday from 11:30 am - 1:30 pm during the months of June, July, and August. The city of Fort Wayne’s commitment to promoting commerce and economic growth is still quite strong, and with the new programs put into place to improve the downtown community the future looks bright for its residents and local business owners. Consider what you can learn from Jim and anyone willing to RE.THINK how things get done.